The iconic OSP kitchen design is complemented by a professionally equipped kitchen with everything you need including Viking appliances. You can grill outside on the built-in Viking gas grill on the deck. A sunken countertop provides easy access to the sink and work surfaces. One Steamboat Place residences feature rich colors, natural textures, and sumptuous fabrics throughout the home. Each master bedroom offers a gas fireplace. The main master bath features a flush entry shower and Jacuzzi tub. In this residence, 3 bedrooms offer a King bed with private bath. The third bedroom offers a King bed and a fully ADA compliant bathroom. The fourth offers two sets of bunks - each with a Twin bed over a Queen bed also with a private bathroom. The home office nook boasts an iMac home computer and high-speed Wi-Fi throughout the residence on a private network allowing internet service for all guests. A printer is available at the front desk and guests can also videoconference with the front desk from the home office. There is a Sonos music player to enjoy music easily. Enjoy all the signature touches throughout One Steamboat Place provided by Timbers Resorts including exquisite gathering areas, wine cellar, and tasting room and one of the greatest mountain spas in the West. In addition to Steamboat's recreational opportunities, One Steamboat Place has a state-of-the-art fitness facility, pool, and hot tubs, a community game room and Little Tykes room for the kids. 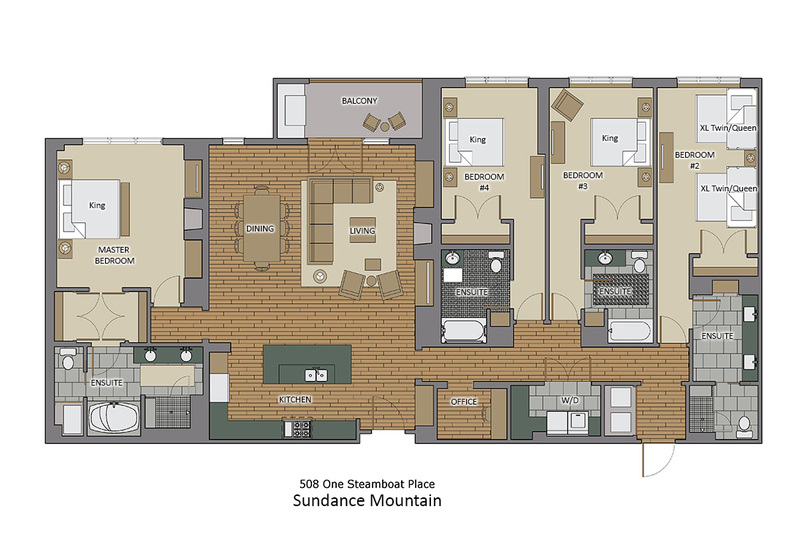 With numerous in-residence catering options, free continental breakfast during the winter, concierge and ski valets, the Private Residences at One Steamboat Place have defined the first-class experience at Steamboat.